I hope everyone is well and had a lovely half term break. Today I have some exciting news to share with you all that I have had one of my cards on the reader page of a craft magazine! 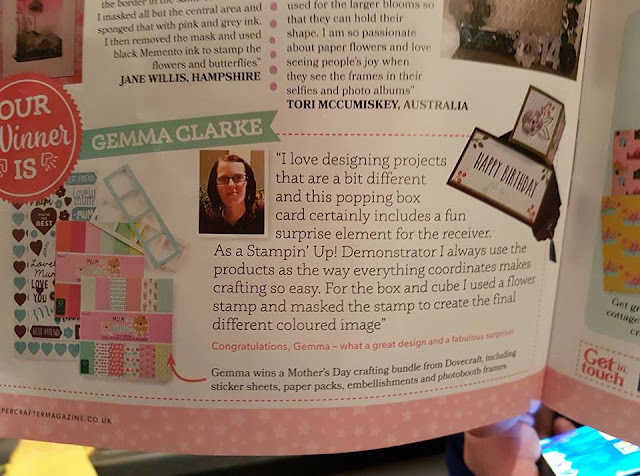 Last month I shared a photo on the PaperCrafter Magazine Facebook page of my mini poppin box card and they then contacted me to ask if I would like to be on their reader page! Well I was so excited of course I accepted! They asked me to write a few words about it and send a picture. Then a few days ago I was contacted again by PaperCrafter and they told me I had won some crafty goodies as I was their winner for this month, as you can imagine I was over the moon and I rushed out and bought a copy of the magazine which is issue 118. Here is a photo of the piece in the magazine, Not the greatest picture but it's so hard trying to photograph a shiny magazine!